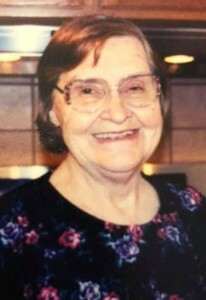 Ethel Hartley Collins, 88, of Garrison, passed away peacefully with family at her side Saturday morning, February 9, 2019, at Hempstead Manor in Portsmouth, Ohio. She was born October 3, 1930, in Carter County, a daughter of the late Roy and Julia Bloomfield Hartley. Ethel was a member of the Emmanuel Baptist Church and along with her husband operated Collins Grocery in Garrison where for over 38 years she enjoyed visiting with her many friends in her community. She was known to have a green thumb and enjoyed working with her flowers and working with her husband on their farm. Ethel is survived by two sons, John Allen Collins (Marsha) of Garrison, and Sherman Dale Collins (Sherri) of Franklin Furnace, Ohio; three daughters, Faye Collins Raines (Fred) of Abbeville, South Carolina, Wilma Collins Kuykendall (Phil) and Rebecca Mae Collins all of Lexington; two brothers, Thurman Hartley and Donald Hartley; 10 grandchildren, Carrie R. Cavanaugh, Kristin M. Raines, Amanda R. Morgan, Patrick Collins, Corey Collins, Lacey C. Patton, Jesse C. Kuykendall, Rachel H. Kuykendall, Andrew D. Collins and Melissa L. Collins; and 18 precious great-grandchildren. She also leaves many other family members and friends who will sadly miss her. In addition to her parents, she was preceded in death by her husband of 47 years, Ralph W. Collins; four brothers, Donald Hartley, Vernon Hartley, Elza Hartley and Watt Hartley; and two sisters, Laura Mae Hartley Strausbaugh and Lena Hartley Kamer. Services will be at 1:00 p.m. Monday, February 11, 2019, at Globe Family Funeral Chapel in Garrison with Bro. Oval Osborne officiating. Burial will follow in Waring Cemetery at Garrison. Friends may visit from 10:00 a.m. until 1:00 p.m. Monday, February 11, 2019, at Globe Family Funeral Chapel, 103 Dudley Avenue at Garrison.